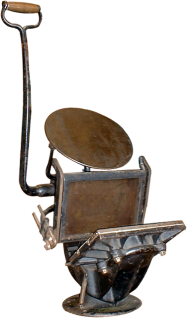 William Golding made a number of different style presses, among them the Official, which was manufactured between 1881 and 1893. For more information on Golding and his other presses, see Official No.2. Serial numbers for the Golding presses can be found in the middle of the bed of the press, directly under the ink disc. This Official has a serial number of 1055 and was manufactured January 17, 1889.